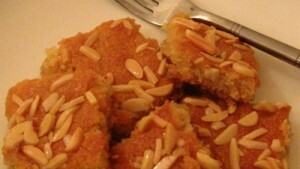 Basboosa recipe by Ameera Alfalasi at DesiRecipes.com. Add all syrup ingredients in a pot and bring to a boil... remove from heat as soon as sugar is dissolved. remove from heat for 5 minutes then place in the freezer for 15 minutes, then refrigerator until cake is done so that is is very cold. mix all cake ingredients except almonds in a bowl with a wooden spoon and pour into a greased 9X13 baking dish (glass is best but anything is ok). Using a knife act as if you are going to cut it into squares by just making lines in the surface. Slice each almond in half lengthwise and place 1 of those halves in the center of each square. Bake uncovered for 30 minutes. The sides should just be getting browned. Remove from oven and increase oven heat to broil/grill (the top element of the oven will be the only one on) Using a knife dipped in water (so it cuts smooth), slice the cake into the square pieces and keep dipping the knife in the water for each slice. Remove from oven and immediately pour the cold syrup onto the hot cake. Let this sit at least 5 minutes before serving.